It's the annual diver appreciation day at AOP. Bring your C-card and admission is free. Doors open at 9AM. The EFR and O2 classes will be conducted in one day, morning and afternoon sessions. Rescue class involves 2 full days of knowledge development, 2 full days of pool work and one ocean day. Rescue class is physically challenging, anyone interested in it should start some kind of work out routine in order to meet and comply with the performance requirements. EFR and O2 are 49.00 each. You can register for only one or both. Rescue is 199.00. This year I am getting materials at lower rate due to last year's increased activity. 35th annual cleanup at Avalon coming on February 20th. .
Do Beluga whales talk by blowing bubbles? Video of paper nautilus off California - how cool is that? Please DO NOT send us mail to BJ's Restaurant - yes, we occasionally receive mail addressed to us there. This has got to be weird. The event will be held from August 1st through August 16th and gives divers the opportunity to let us know if/where/when they spot Giant Sea Bass. Essentially what we're trying to do is obtain a baseline fish count in the Southern California area, so we can monitor the success efforts to rehabilitate giant sea bass populations since the near local extinction of these gentle giants in the 70's. I've attached a copy of the event flyer to this email and hope that you could help distribute/display this flyer to as many recreational divers as possible. It's really informative and provides some more detail about what we’re specifically asking people to do during the count. If you have meetings any time up until the start of the Count we would love to be able to talk to your members in person. 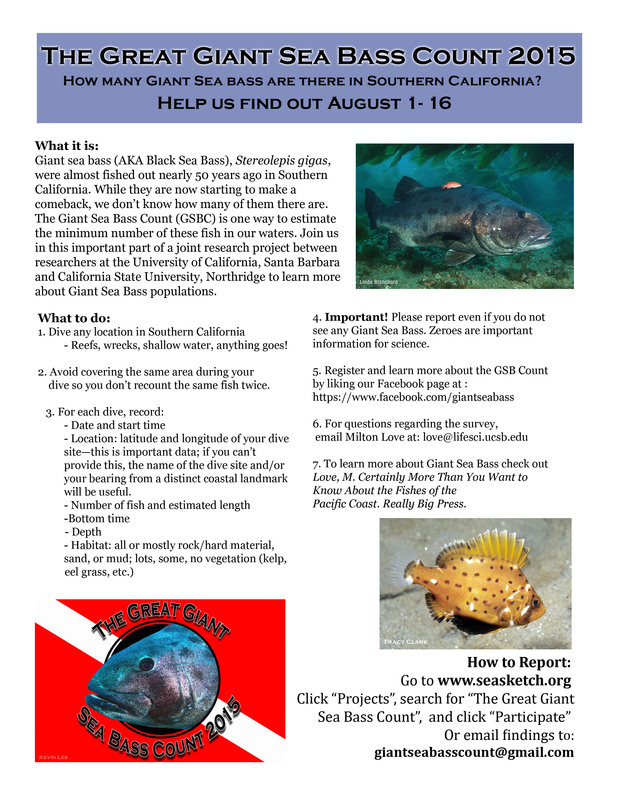 If your club already has dives planned during August 1-16th all they have to do is report back to us with some basic information about their dive and whether or not they saw any giant sea bass. If you don't have dives planned, it could be fun to try to plan a trip to go see them. I can direct you to a few sites where people report seeing them often. We really appreciate any help with advertising the Count via Facebook page, newsletter, or web page, as well as any participation during the event. If any dive shops or clubs come to mind that might be interested please don't hesitate to let me know so I can contact them and get everyone in on the event! And of course, feel free to email or call back if you've got any questions on the count or any/all things giant sea bass! A toxic algae bloom in the Pacific Ocean stretching from California north to Washington state might be the largest ever detected off the U.S. West Coast, scientists said on Tuesday. The bloom, which first appeared in May, involves microscopic algae that produce a neurotoxin potentially fatal to humans called domoic acid, according to researchers at the University of California at Santa Cruz.